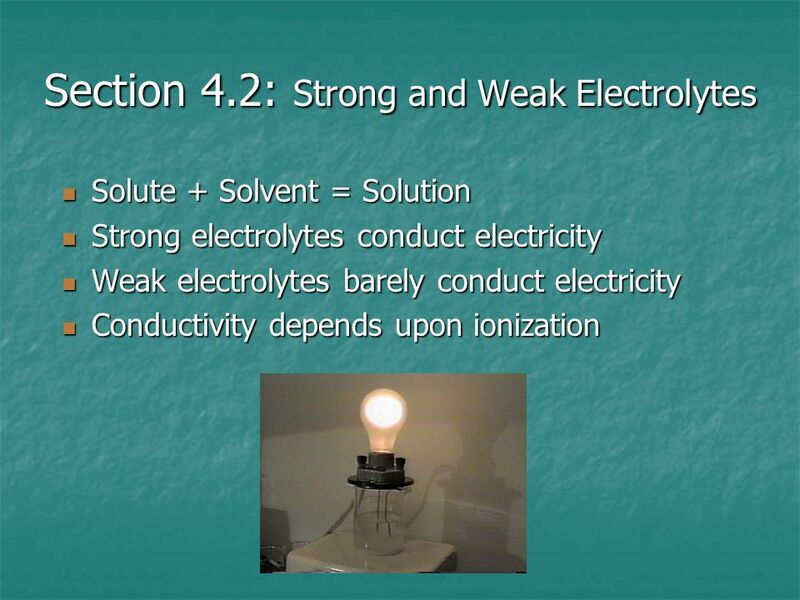 Solute + Solvent = Solution Strong electrolytes conduct electricity Weak electrolytes barely conduct electricity Conductivity depends upon ionization Solute is what is being dissolved (not necessarily solid). Solvent is doing the dissolving (typically more of this present). Solution is homogeneous mixture. More ions present, more conductivity because the ions are the substances capable of carrying a charge and complete the circuit. 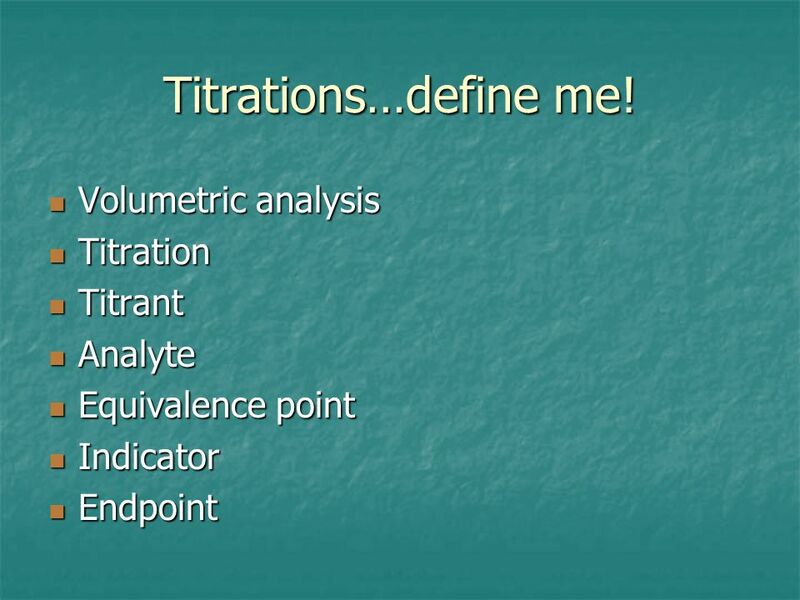 Strong Electrolytes Soluble salts Strong acids Strong bases All of these dissociate completely in water. 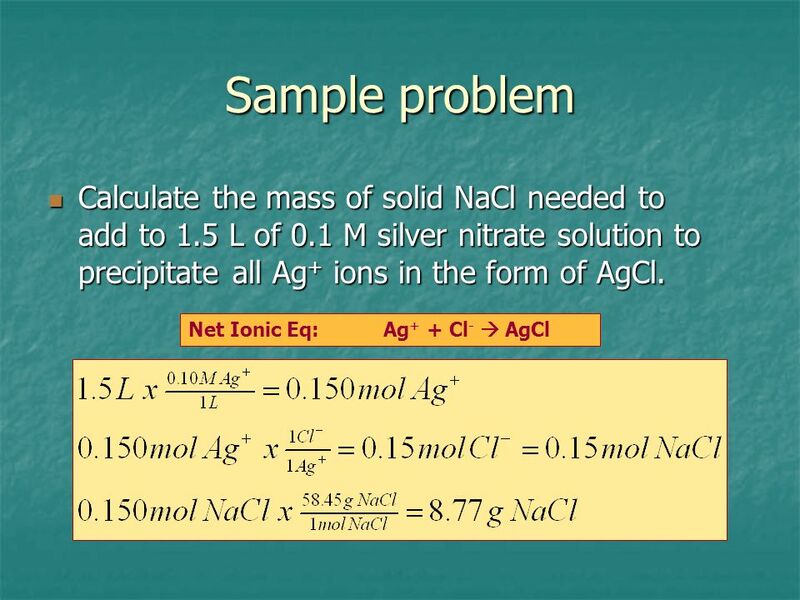 Weak Electrolytes Weak acids Weak bases All of these partially dissociate in water HCl  H+ + Cl- NaOH  Na+ + OH- HC2H3O H+ + C2H3O2 Weak electrolytes are represented at equilibrium because the ions combine to make the molecule again. 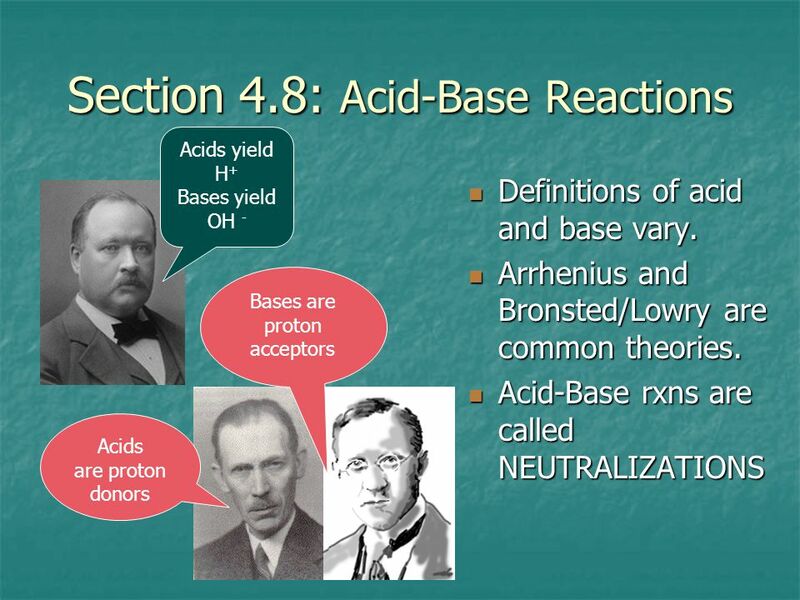 In the case of ammonia, the ionization occurs very slowly since it is not favored to occur. 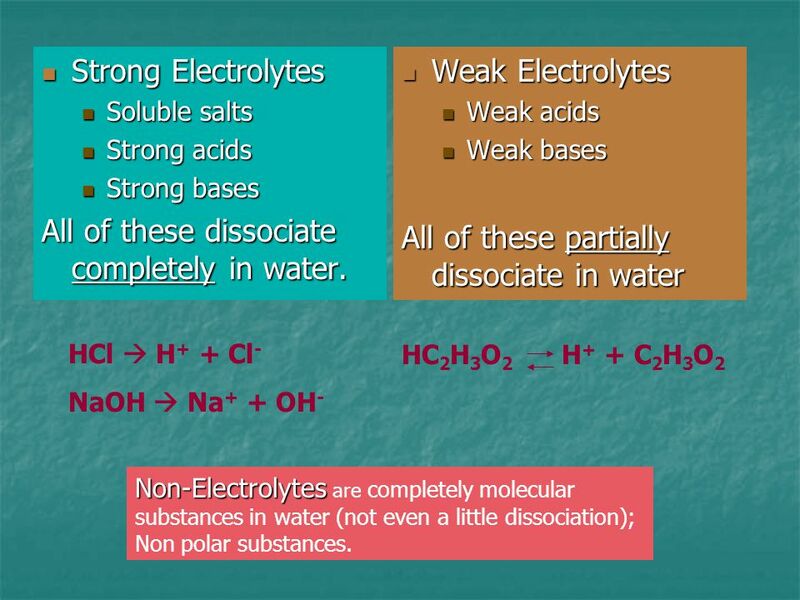 Non-Electrolytes are completely molecular substances in water (not even a little dissociation); Non polar substances. 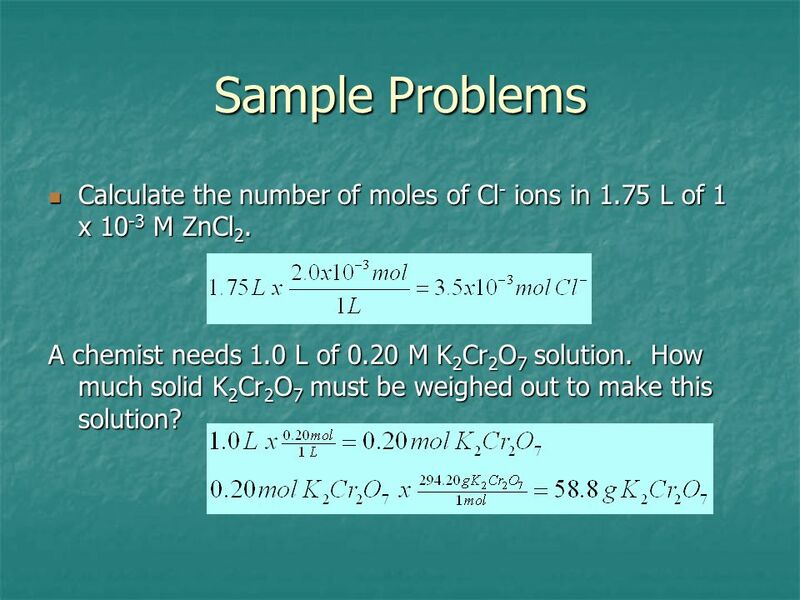 7 Sample Problems Calculate the number of moles of Cl- ions in 1.75 L of 1 x 10-3 M ZnCl2. A chemist needs 1.0 L of 0.20 M K2Cr2O7 solution. How much solid K2Cr2O7 must be weighed out to make this solution? DUH! This is chem 1 material. 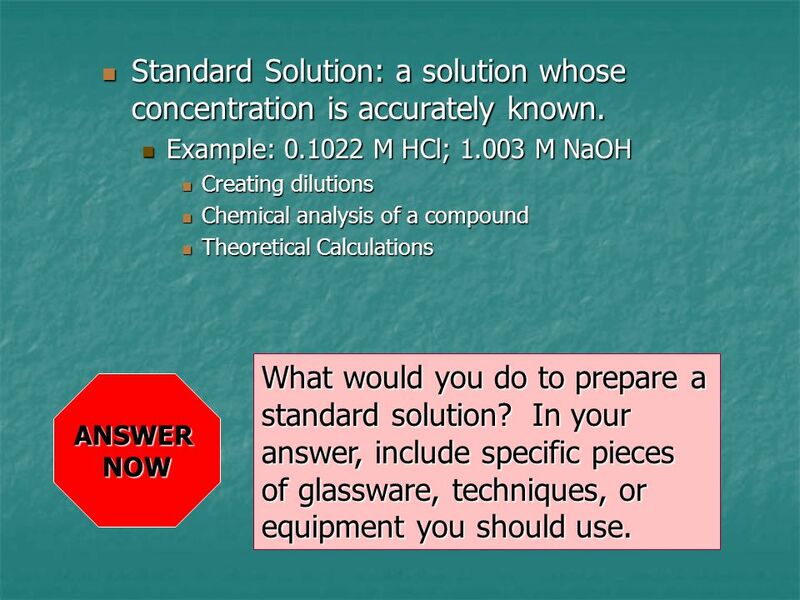 8 Standard Solution: a solution whose concentration is accurately known. 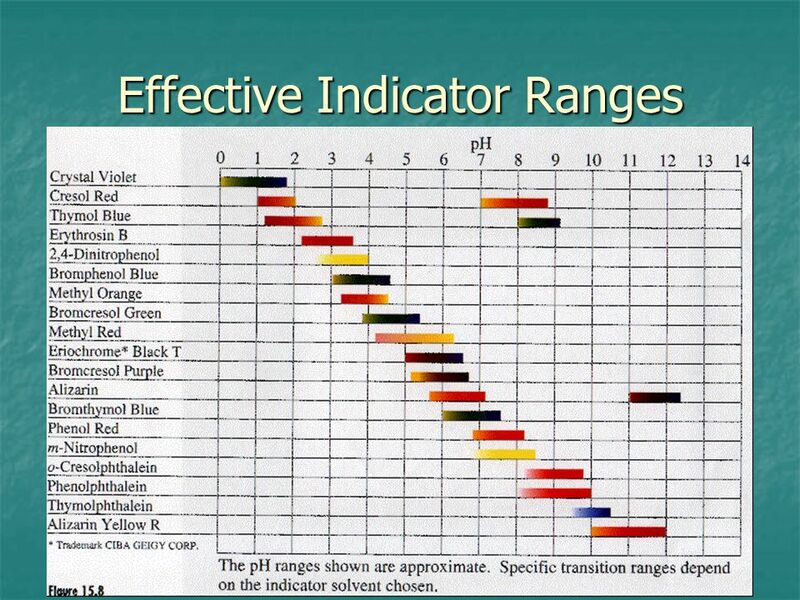 Dilutions Dilution is the process used to make the solution less concentrated. 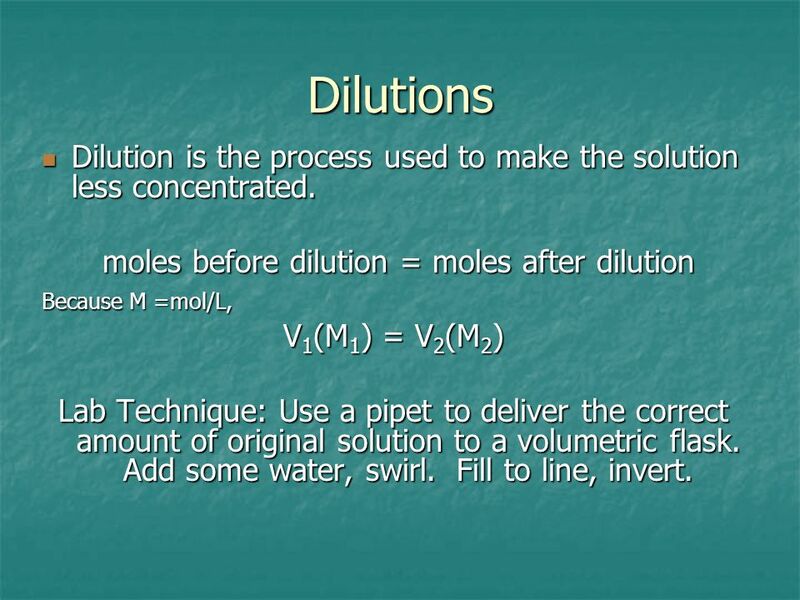 moles before dilution = moles after dilution Because M =mol/L, V1(M1) = V2(M2) Lab Technique: Use a pipet to deliver the correct amount of original solution to a volumetric flask. Add some water, swirl. Fill to line, invert. 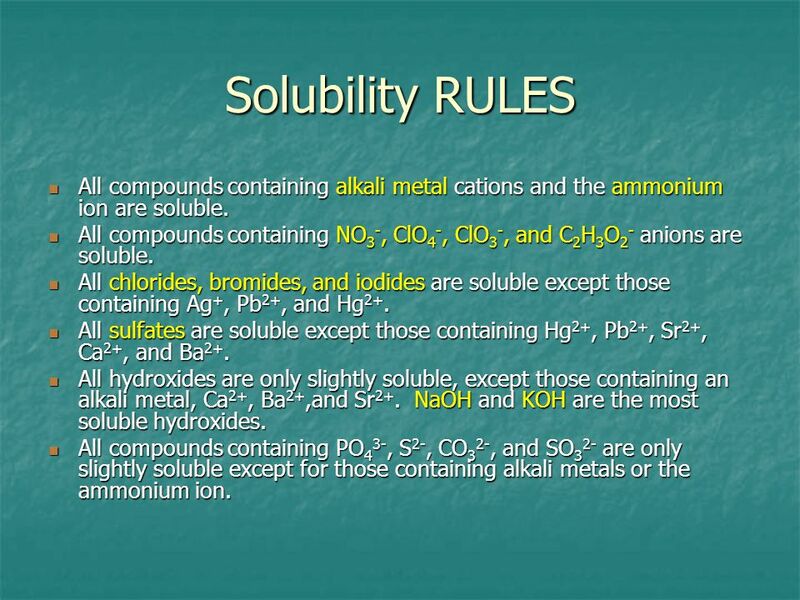 13 Solubility RULES All compounds containing alkali metal cations and the ammonium ion are soluble. All compounds containing NO3-, ClO4-, ClO3-, and C2H3O2- anions are soluble. All chlorides, bromides, and iodides are soluble except those containing Ag+, Pb2+, and Hg2+. All sulfates are soluble except those containing Hg2+, Pb2+, Sr2+, Ca2+, and Ba2+. 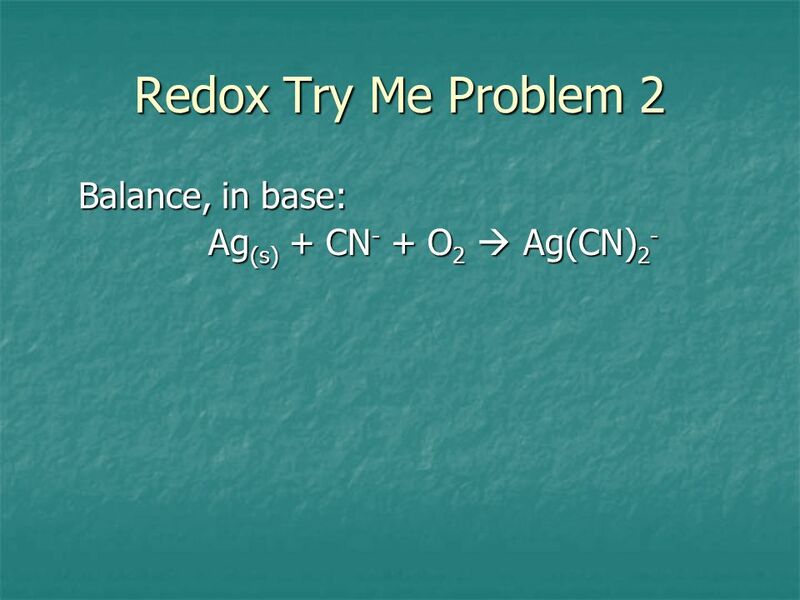 All hydroxides are only slightly soluble, except those containing an alkali metal, Ca2+, Ba2+,and Sr2+. 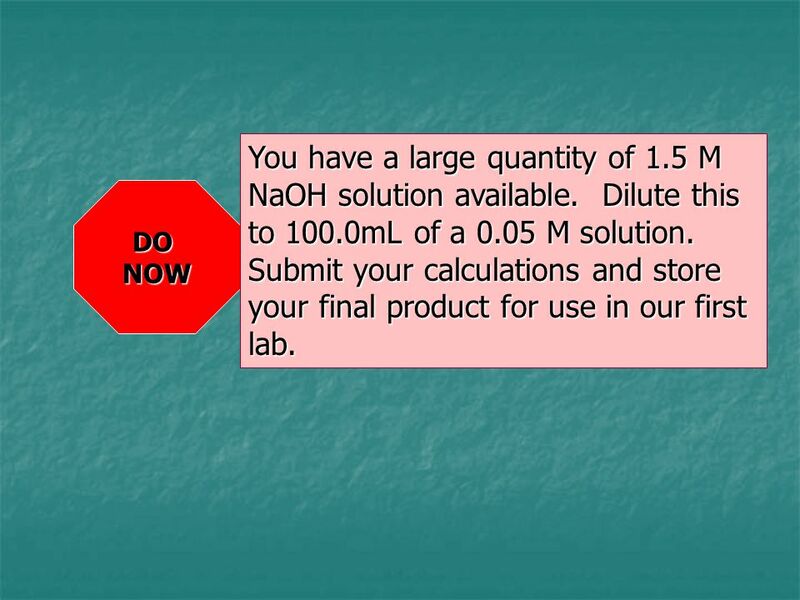 NaOH and KOH are the most soluble hydroxides. All compounds containing PO43-, S2-, CO32-, and SO32- are only slightly soluble except for those containing alkali metals or the ammonium ion. 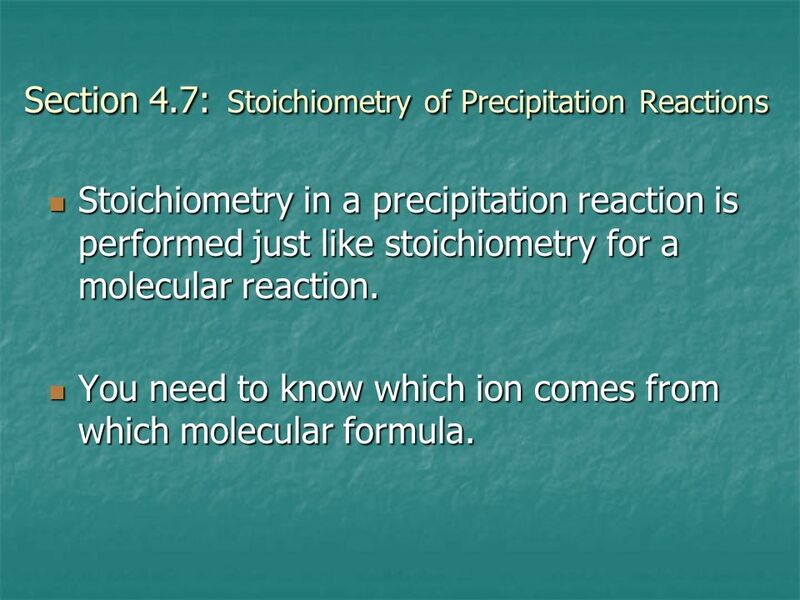 Stoichiometry in a precipitation reaction is performed just like stoichiometry for a molecular reaction. 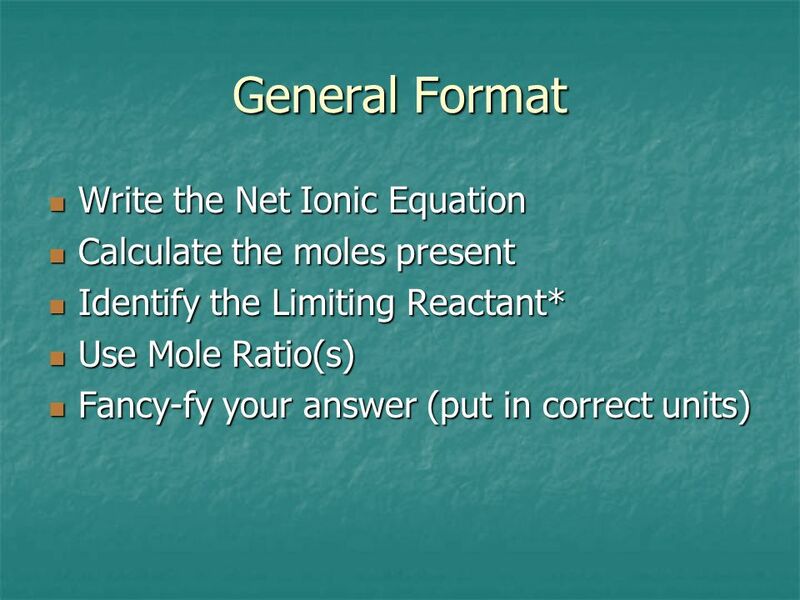 You need to know which ion comes from which molecular formula. 19 Try Me! 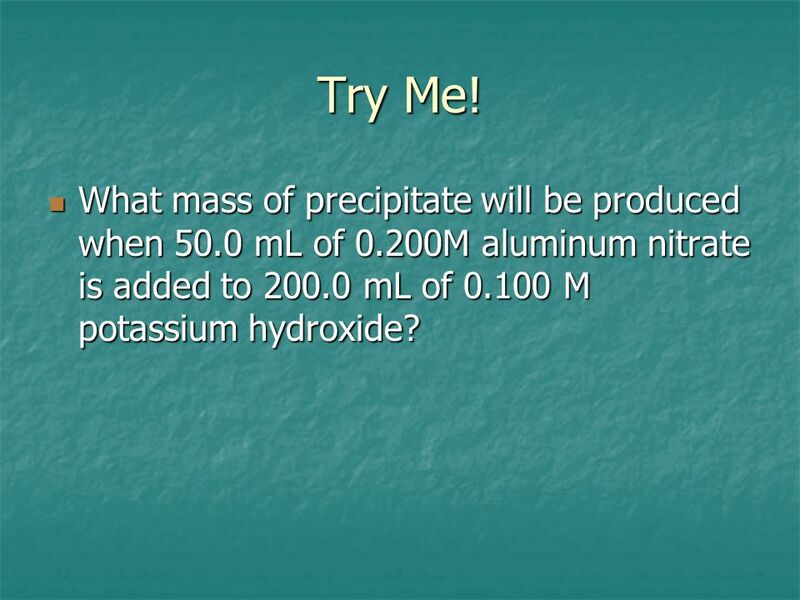 What mass of precipitate will be produced when 50.0 mL of 0.200M aluminum nitrate is added to mL of M potassium hydroxide? Both dissociate completely H+ + OH-  H2O Na+ and Cl- are spectators. 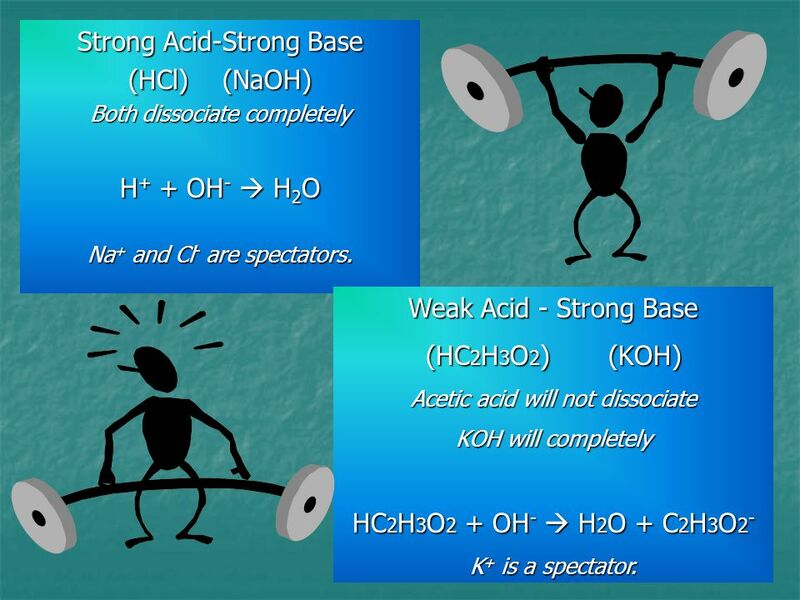 Weak Acid - Strong Base (HC2H3O2) (KOH) Acetic acid will not dissociate KOH will completely HC2H3O2 + OH-  H2O + C2H3O2- K+ is a spectator. 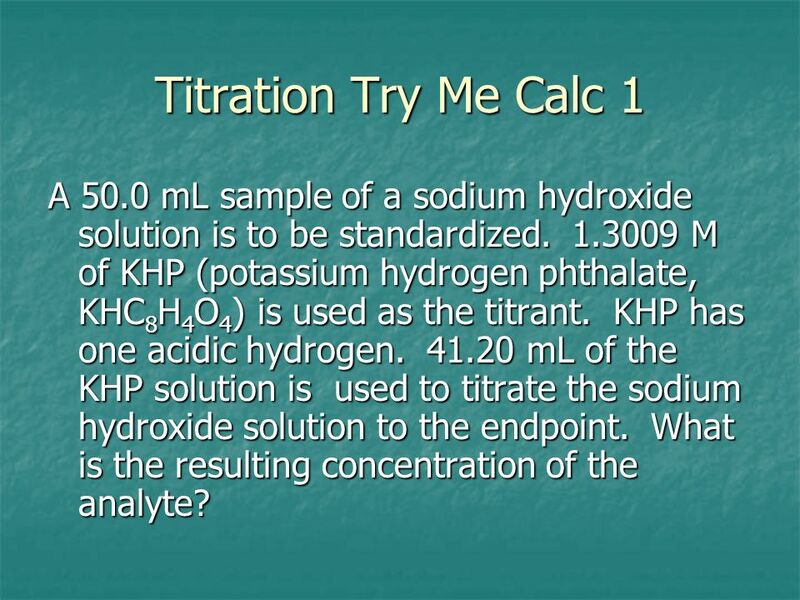 26 Titration Try Me Calc 1 A 50.0 mL sample of a sodium hydroxide solution is to be standardized M of KHP (potassium hydrogen phthalate, KHC8H4O4) is used as the titrant. KHP has one acidic hydrogen mL of the KHP solution is used to titrate the sodium hydroxide solution to the endpoint. 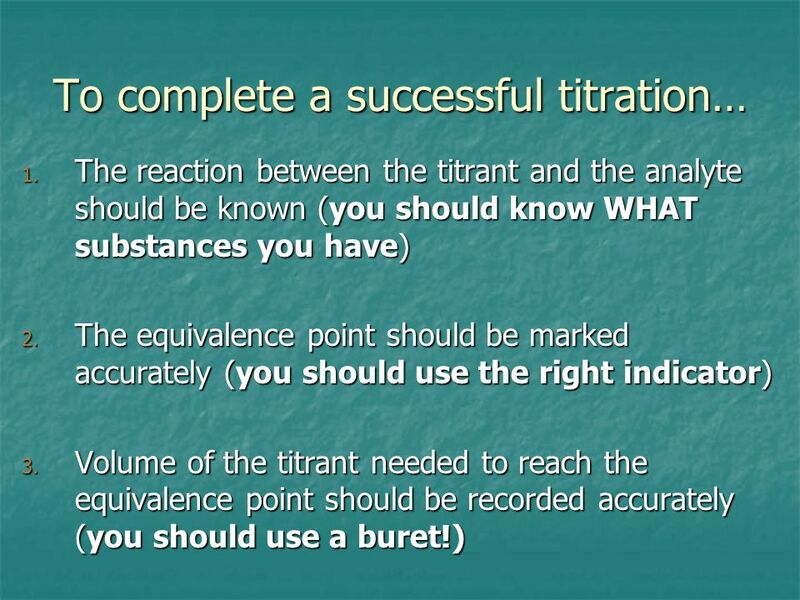 What is the resulting concentration of the analyte? 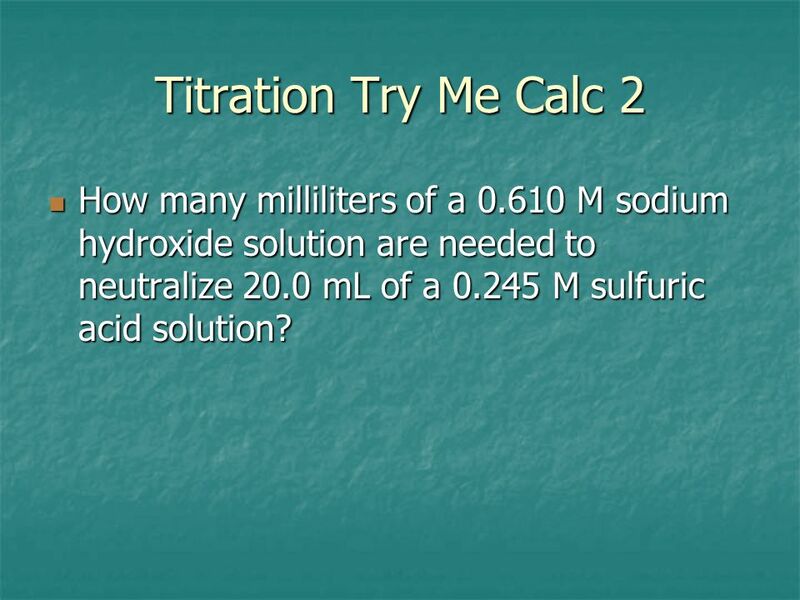 27 Titration Try Me Calc 2 How many milliliters of a M sodium hydroxide solution are needed to neutralize 20.0 mL of a M sulfuric acid solution? 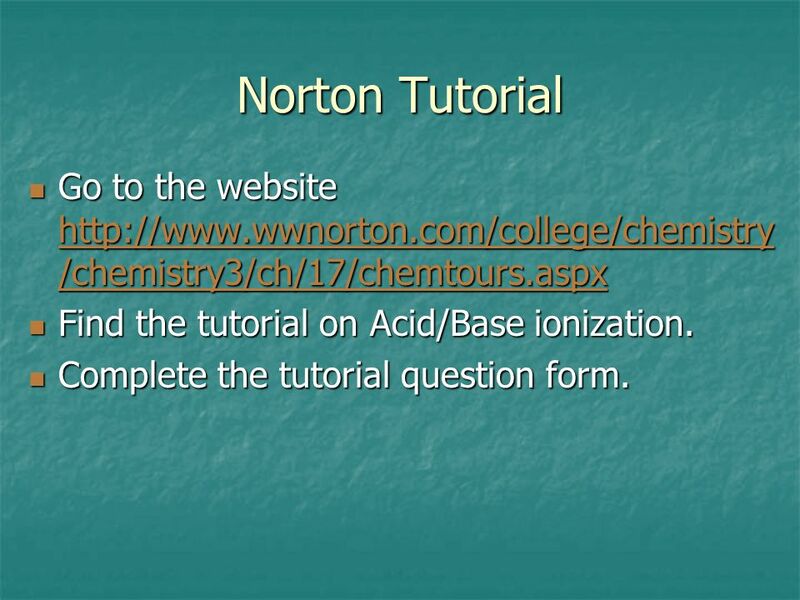 28 Norton Tutorial Go to the website Find the tutorial on Acid/Base ionization. Complete the tutorial question form. What is it?? 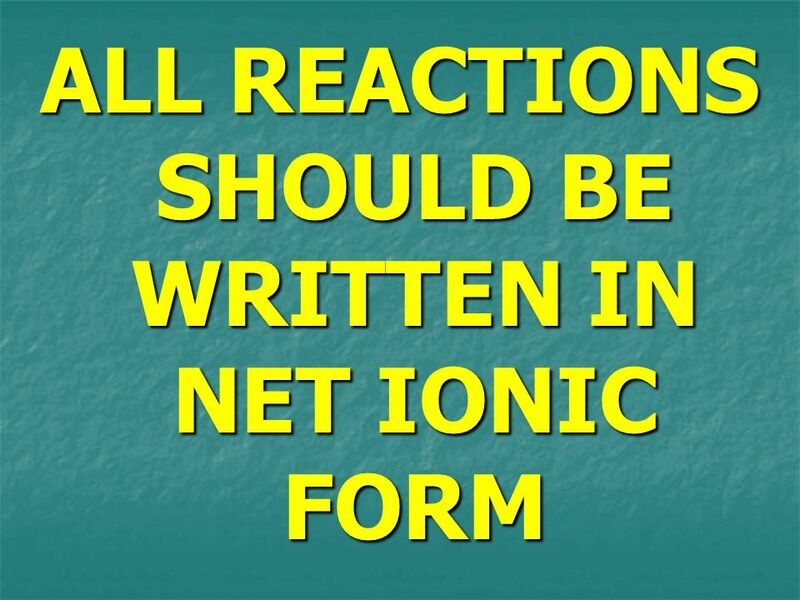 -A reaction that occurs in conjunction with a transfer of electrons. 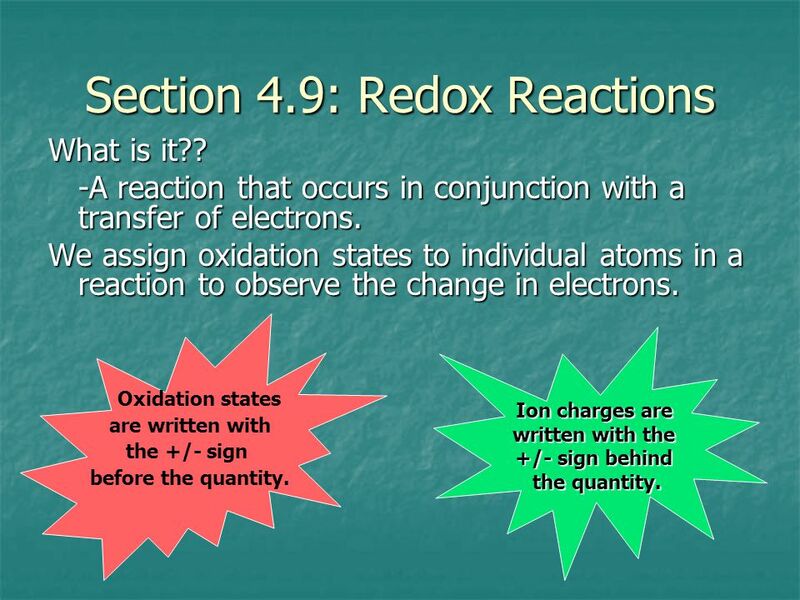 We assign oxidation states to individual atoms in a reaction to observe the change in electrons. 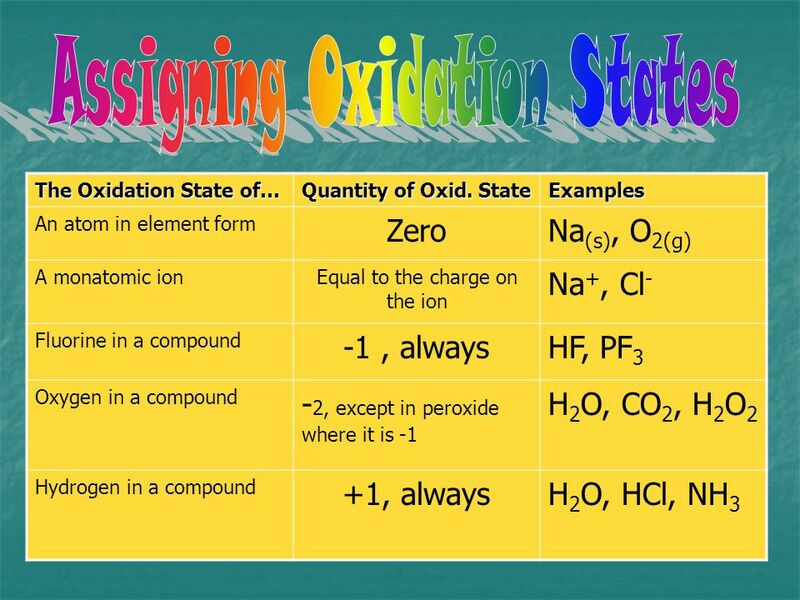 Oxidation states are written with the +/- sign before the quantity. Ion charges are written with the +/- sign behind the quantity. 32 The metal is oxidized and the other substance is reduced. 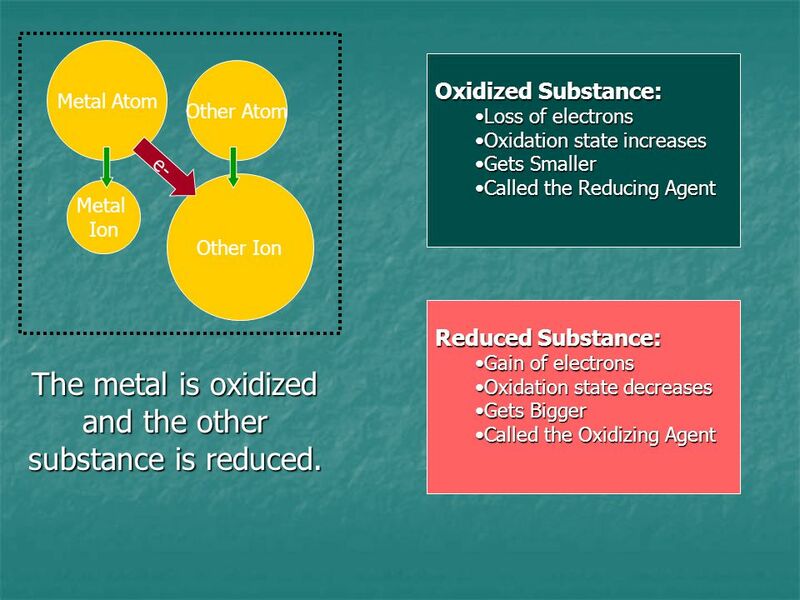 Metal Atom Oxidized Substance: Loss of electrons Oxidation state increases Gets Smaller Called the Reducing Agent Other Atom e- Other Ion Metal Ion Reduced Substance: Gain of electrons Oxidation state decreases Gets Bigger Called the Oxidizing Agent The metal is oxidized and the other substance is reduced. +2 3+ +3 Check Charges! +7 +2 8+ 1- 2+ x5! x5! 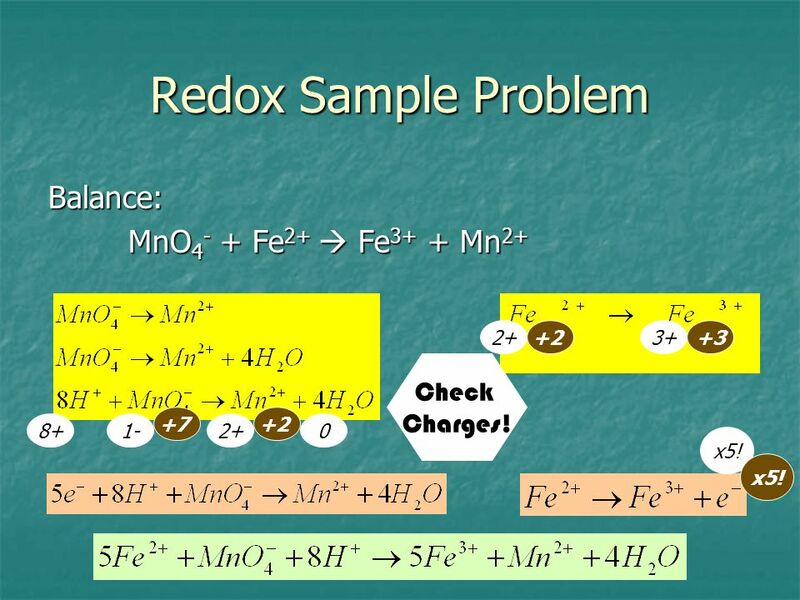 Download ppt "Types of Chemical Reactions And Solution Stoichiometry"
© Copyright R.J. Rusay Aqueous Reactions Dr. Ron Rusay Fall 2007. 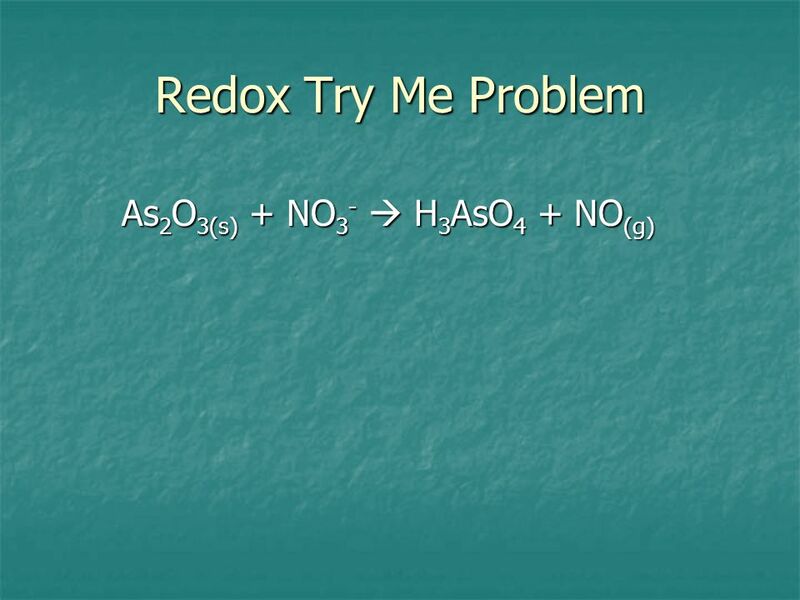 © Copyright R.J. Rusay Aqueous Reactions Dr. Ron Rusay. 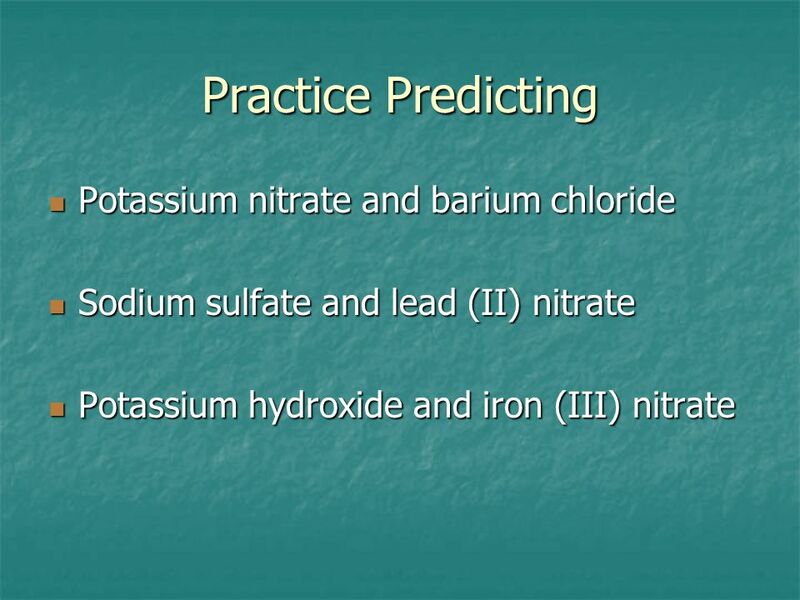 Aqueous Reactions Dr. Ron Rusay. 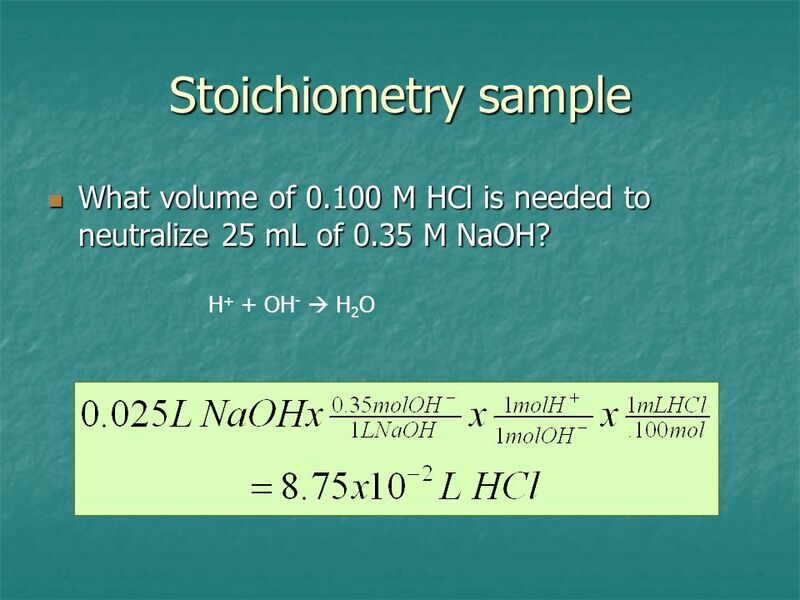 Aqueous Reactions and Solution Stoichiometry. 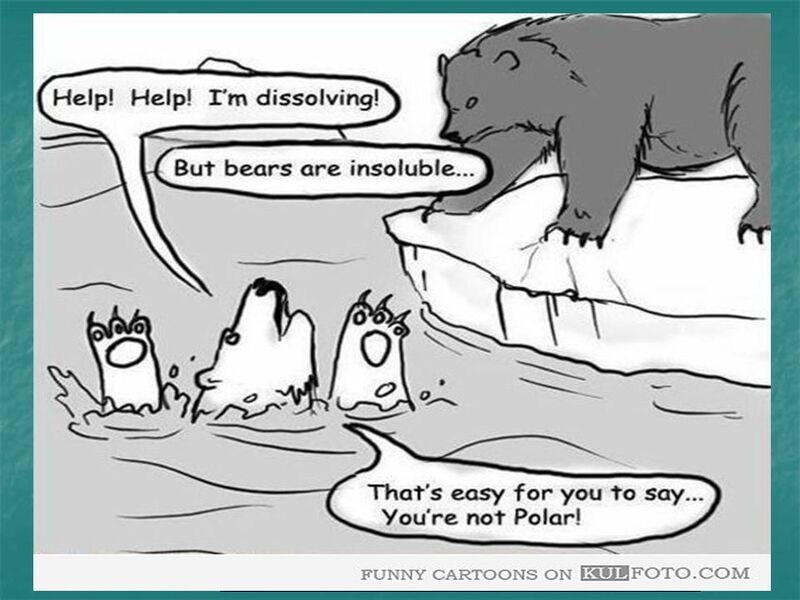 ► Aqueous Solutions – a solution which water is the solvent ► Solution = Solute + Solvent ► Solute = smaller. 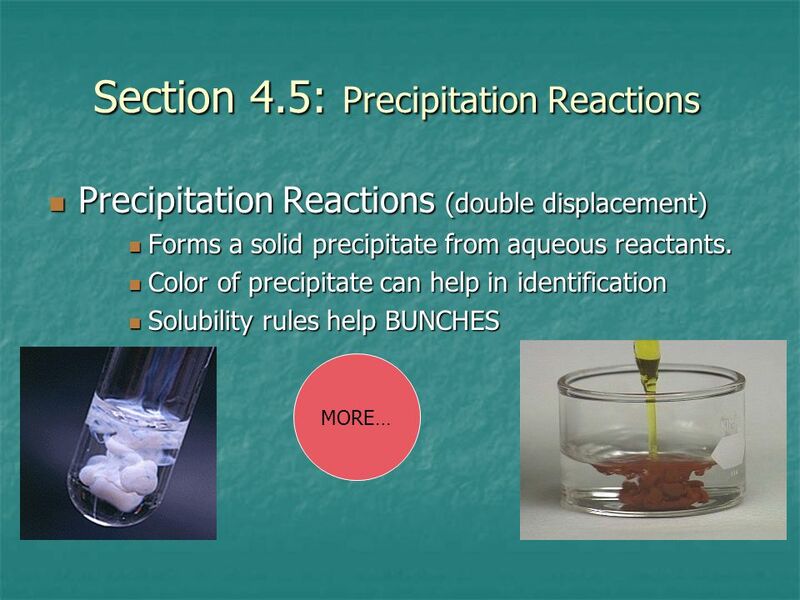 Chapter 3 Chemical reactions. What is a chemical reaction? 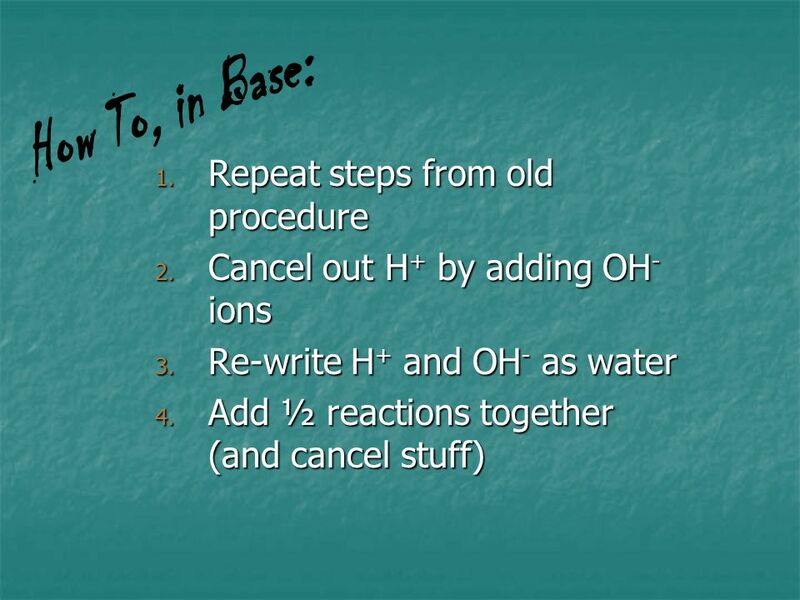 ► The process that brings about a chemical change. 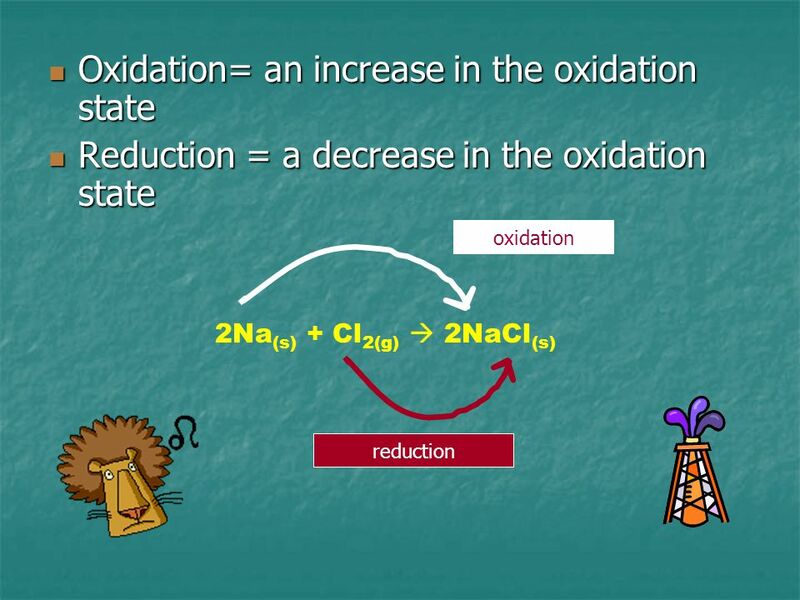 ► The starting material in a chemical reaction. 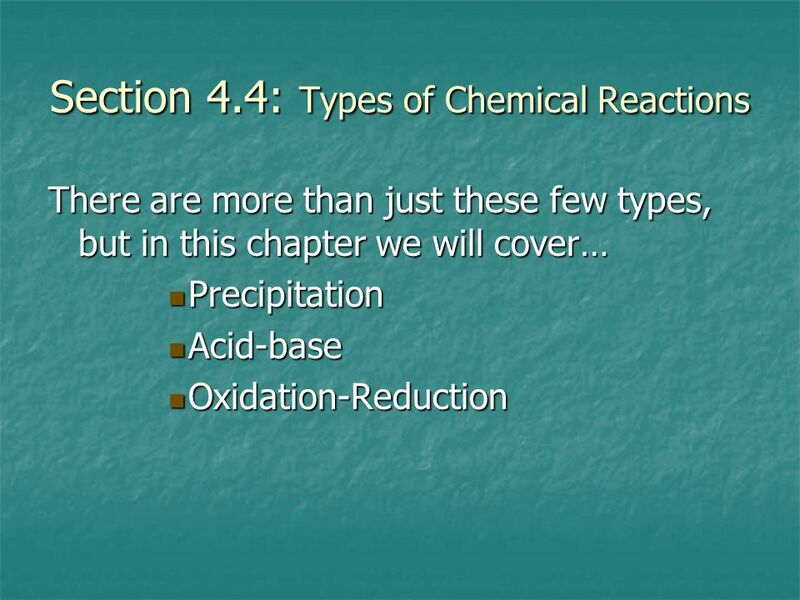 Reactions in Aqueous Solution Chapter 4 Copyright © The McGraw-Hill Companies, Inc. Permission required for reproduction or display. Chapter 4. 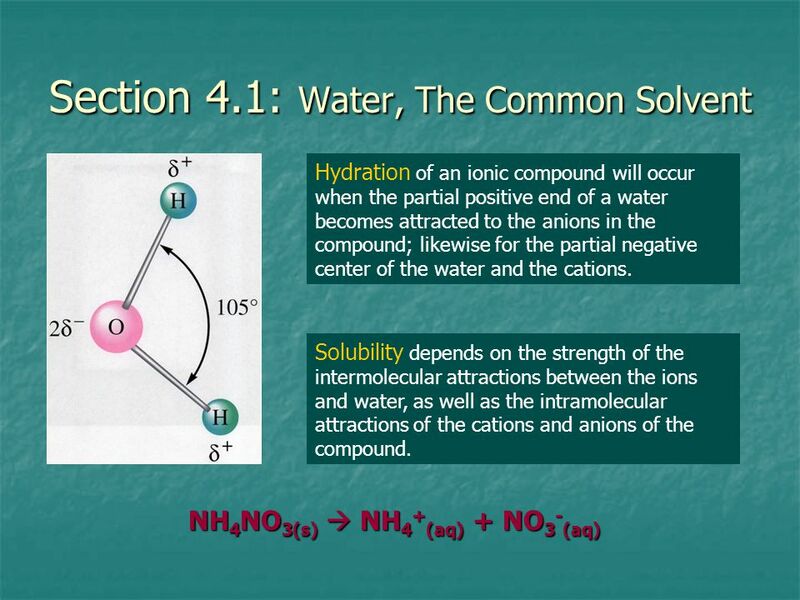 H 2 O, The Universal Solvent Much of chemistry that affects each of us occurs among substances dissolved in water. Virtually all chemistry. 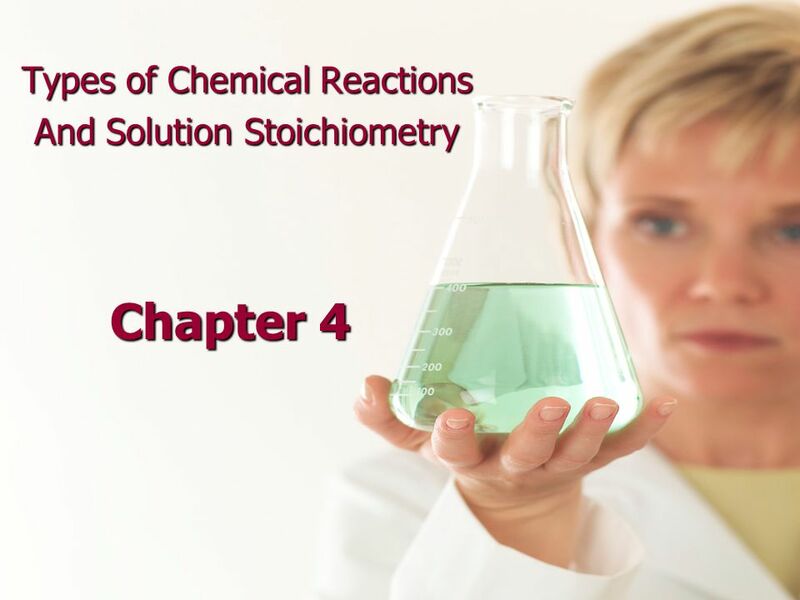 Chapter 4 Types of Chemical Reactions and Solution Stoichiometry. 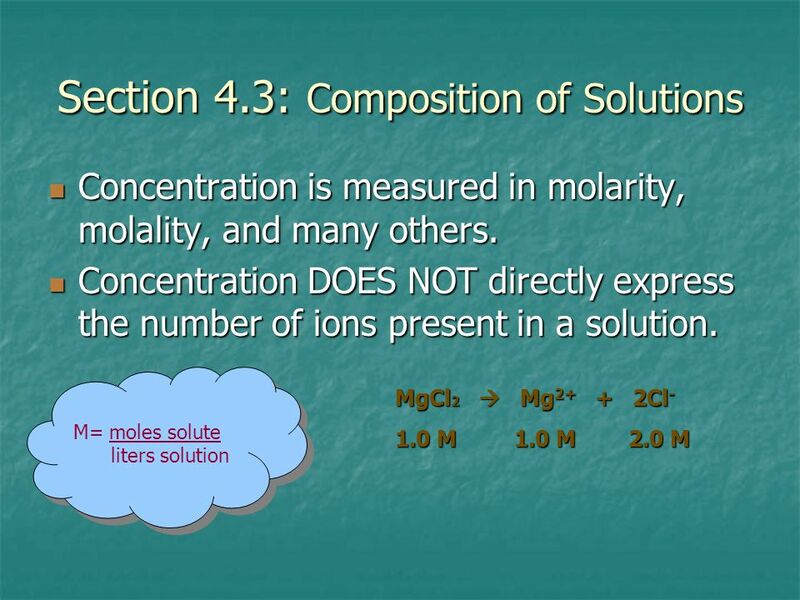 Vocabulary In SOLUTION we need to define the - SOLVENT the component whose physical state is preserved when solution forms SOLUTE the other solution component. 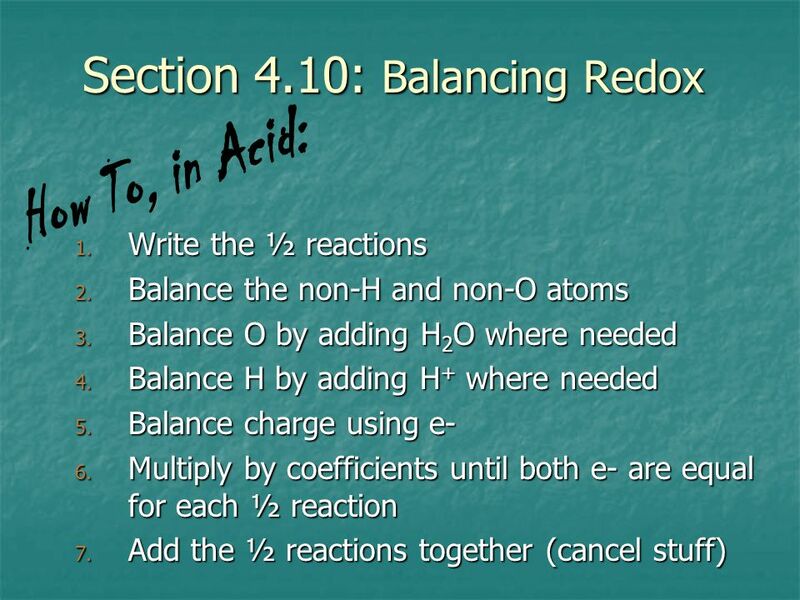 Ch.4 Chemical Rxns and Solution Stoichiometry 4.1 Water.